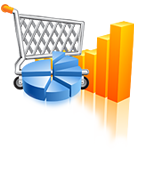 Magento - With Magento online stores are not only perfectly functional but also visually appealing. Based on PHP, it uses MySQL for storing data. Several shops can be managed with separate catalogs on different domains. A highly recommended software for those who simply expect more from their online store. osCommerce - osCommerce is an online shop solution offering a wide range of standard features for quick and easy setup of online stores. Zen Cart - Zen Cart was designed by entrepreneurs for entrepreneurs. The online store software includes all the necessary tools needed to set up a successful online store. The software is constantly improving based on user requirements. OpenCart - OpenCart is a reliable e-commerce solution for online retailers who want to put a value on ease of use, while still taking advantage of many features. A visually appealing interface and search engine friendly design complete the experience. Prestashop - Take advantage of the ease of use and management of this innovative solution for a profitable eCommerce business! As a reliable and flexible software, Prestashop offers many features and a high-quality experience.